Many who had been consistently stonewalled when seeking truth by means of Right-to-Know Requests filed with the city administration have now banded together in an attempt to pool resources in order to do the impossible: Fight City Hall. The Wilkes-Barre City Taxpayers Association (WBCTPA) officially formed in January of this year and held its first meeting at St. Andrew Church on Parrish Street in the city’s Mayflower Section the following month. The group is the brainchild of city residents Sam Troy and Charlotte Raup and was founded by Frank Sorick. At its first organizational meeting the following officers were elected: Frank Sorick, President; Tom Hirko, Vice President; Ellen Evers, Secretary; Dorene Schutz, Communications Coordinator; Linda J. Urban, Parliamentarian; and Karen Ceppa-Hirko, Treasurer. From the outset the group has tackled issues that affect local residents – issues that likely wouldn’t otherwise see the light of day. These have included some sensitive topics such as overspending on budgeted items, the formation of a charter review committee, the day-to-day operations of city hall, and abuses of power by elected officials, or, rightly termed, our public servants. Although the group does have its critics in both city officials and a handful of residents, the Association in its brief existence has already made an impact on city business practices, and has attracted overwhelming support from those seeking honest, efficient, and accountable government. 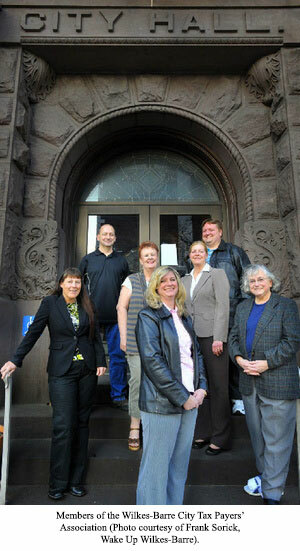 The Wilkes-Barre City Taxpayer Association is not confined to the city limits. Not only is its membership drawn from the entire Wilkes-Barre Area School District, but participation is encouraged from surrounding Luzerne County as the watchdog group addresses matters of concern affecting all county residents. And, the Association is even receiving inquiries from throughout Northeast Pennsylvania, especially Scranton, as that sister city confronts many of the same financial woes now facing Wilkes-Barre. The WBCTPA first reviewed overspending on budgeted items such as City Council trips and per diem allowances. Originally budgeted at $10,000 per year, they uncovered that actual spending has been nearly double that amount each year for the past eight years. The worst offenders were found to be City Council members Bill Barrett and Kathy Kane. The Association also reported that not all council members abused the per diem privilege, in fact, former City Council member and current District Court Magistrate, Rick Cronauer actually returned his meal allowance for meals provided at an event he was attending. To the best of the group’s knowledge, Rick is the only city official who has ever returned a per diem allowance. Another budget item that has been explored by members of the group is the “million dollar mystery:” the purchase of fire engines in 2006 that has yet to be properly explained according to Karen Ceppa-Hirko, who asks, “How did the city evade the bid process?” Investigation is continuing into this important matter. One of the hottest issues currently before the Association is the potential lease of the city’s parking assets. Any such deal would impact not only residents but downtown business for years to come. Concerns have once again been raised that the current city administration has not been open and forthcoming regarding all aspects of the deal. The WBCTPA has pointed to billing inconsistencies, no-bid contract awards, and closed-door meetings. Residents should be concerned since parking rates would more than triple under the proposal according to the city’s Request for Proposal. Apparent billing inconsistencies have included Goals Consulting, a company owned by former city administrator J.J. Murphy. On an itemized list of charges, Goals billed for two seven-hour preparation meetings at their discounted rate of $300 per hour. Yet invoices received from the Fox Rothschild Law Firm, a firm through which Goals Consulting was to be paid for their analysis, contain no mention of either meeting. The Fox Rothschild Law Firm is based in Philadelphia and owned in part by one Patrick Murphy, none other than the brother of J.J. Murphy, and hired by the Wilkes-Barre City Parking Authority to lease its parking assets. No-bid contracts. The hiring of the Fox Rothschild Law Firm and Goals Consulting was performed absent a bid out, even though the city is required to solicit bids for professional services in excess of $20,000. Inexplicably, to date, Fox Rothschild and Goals Consulting has billed the city’s parking authority in excess of $120,000. Closed-door meetings. On June 11th reporters from both the Citizens Voice and Times Leader were ejected from a private meeting held by the Parking Authority. The Association has also scrutinized the city’s contract with the city tower, LAG Towing. At a recent council meeting, newly elected council member Tony George proposed a motion for the city to terminate its contract with LAG Towing on grounds of the tower’s lack of cooperation. This motion was a significant development in a year-long call for greater transparency into the operations of LAG and the nature of the city’s affiliation with the company. One of the initial red flags prompting inquiry by members of the WBCTPA, and a warning sign that actually contributed to the formation of the group was the disappearance of city’s credit card statements. Statements being questioned were those of Mayor Leighton, J.J. Murphy and Marie McCormick. The city refused to produce several omitted statements, and claimed these records never existed. The persistence of the group’s members combined with the subpoena process eventually led to a production of the documents by the bank directly. The city now claims that no receipts exist for any of the once-missing credit card statements. This is an ongoing investigation and the Association wonders aloud what might be contained on those receipts. The city is required by state law to maintain all records for seven years. Only City Council has the authority to destroy records permanently and that must be accomplished only by means of a Council Resolution after the requisite seven years have elapsed. The new sheriffs in town are only digging deeper and deeper as they investigate unethical hiring practices by the city, pursue repayment for misspent expenditures including private home security systems and monitoring fees, seek altered and falsified documents, and examine possible perjury by city officials, the sale of the Parsons firehouse (which included the World War II memorial), and cost overruns at the intermodal center. To get involved visit www.wilkesbarretaxpayers.com. All meetings are held on the first Tuesday of each month (except this July) at St. Andrews Parish 316 Parish Street. 7:30 to 8:30 p.m.